Sometimes an audio amp will present strange behavior. Strange hum behavior is one, interference that seems sensitive to volume control settings or closeness to external objects in an AM radio can sometimes be cured by using a grid stopper. Parasitic supersonic oscillations tend to occur with high gain tubes. Tubes like a 12AX7 or 12AV6. The grid stopper resistor in combination with the Miller capacitance of the tube as seen by the grid works as a low pass filter to prevent the parasitic supersonic oscillation. Guitar amps using 12AX7s often use a 68K resistor connected physically as close as possible (using a short lead) to the grid pin of the tube. This resistor is in series with (the coupling cap and resistor to ground) circuit. An example is seen in the below diagram. 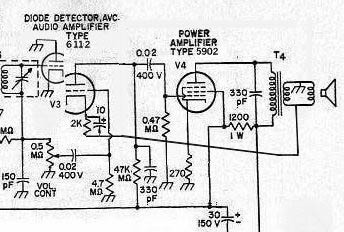 The MIller capacitance of a 12AX7 is around 150pF, and this forms a low pass RC filter at around 100KHz. Sometimes a high gain output tube needs a grid stopper. 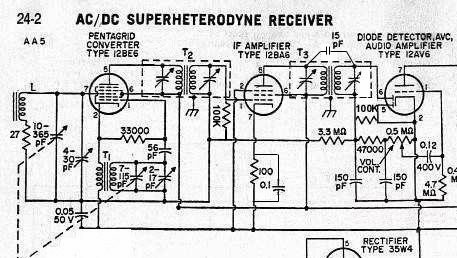 An example I had was that a 60HL5 needed a "grid stopper" resistor of around 4.7K to avoid oscillations at supersonic and RF frequencies. This tube has a high gm. The resistor and the stray capacitances in the tube form a low pass filter that kills gain at frequencies above audio, thus stopping the oscillations. These oscillations can cause audio distortion and can also trash some AM band frequencies. 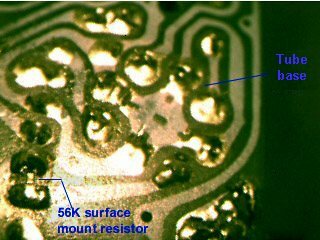 I used a surface mount resistor to bridge across a cut I made in the circuit board trace feeding the 60HL5's control grid. Makes for a neat install. More bandwidth on the IF for higher AM reception fidelity, down below the feedback section. If you have a particularly good sounding AA5 radio with a nice speaker and cabinet (or you could replace the speaker with one intended for car audio), it is possible to add some negative feedback for better fidelity. Some reduction in hum can also be had with negative feedback. There's usually plenty of audio gain avaliable in an AA5 tube radio to allow some use of feedback, as feedback will reduce gain. At first I tried some feedback into the cathode of the 12AV6, but this cathode also serves the diode detector circuit. Oh, it worked, but the feedback ends up being applied to two paths, which, depending on the volume control setting, would tend to cancel out. One solution to this problem is to use a twin triode tube like a 12SL7 or 12AX7, using one section as the triode audio stage with the feedback going into the cathode. Place an additional 56K resistor from the plate to B+ to make the plate load 47K. And use a 2K resistor on the cathode, this cathode resistor bypassed to the voice coil output transformer secondary. Doing this gives us about 2 dB of additional gain, as the plate impedance is lowered. Thus the output tube grid resistor won't load it as much. I used a surface mount resistor on the bottom of the AA5's circuit board. The other triode section is wired as a detector diode, grid to the IF transformer, plate and cathode to ground. See Fig 2 below. Another method without this drawback is possible. It involves adding a third winding to the audio output transformer. About ten turns around one of the outer legs of the iron core laminations will do. See Fig 1. But as this winding will be carrying the audio input signal, it will need to be shielded from the other windings of the transformer. 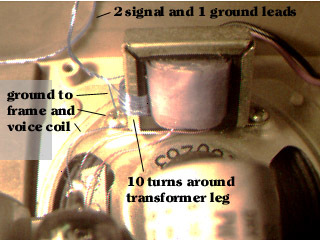 Use some copper foil tape between this new winding and the other windings of the transformer. And also use some foil tape to shield the windings from the outside world. Ground these shields and the transformer laminations. Be sure not to create a shorted turn around the leg of the iron core. And shield the two leads of this new winding from the transformer back to the 12AV6 circuit. Or if there's enough room in the transformer, you could use very thin coax cable for the new windings. Ground only one end of the shield of the coax. In Fig 3, I didn't need the foil tape. I grounded the transformer laminations and also grounded the voice coil. The voice coil winding (being the outer winding over the primary winding) being grounded acts to shield the new feedback winding from the primary winding. This feedback winding subtracts a little bit of the output signal from the input signal without affecting the detector circuit. That then creates the negative feedback loop. If phased properly, you should be able to short the feedback winding and hear the audio level *increase* a couple of dB, and have less fidelity. The capacitor usually connected to the plate of the output tube can be reduced to a few hundred pF's, or removed completely. The feedback loop will now keep the radio from sounding shrill. Which way is the audio transformer phased? We need a negative feedback loop. Phased the wrong way we will get an oscillator instead of an amplifier! If that happens, reverse the leads on the audio output transformer's new winding at the 12AV6 (Fig 1), or the speaker driver winding if you used feedback into the first audio triode's cathode (Fig 2). 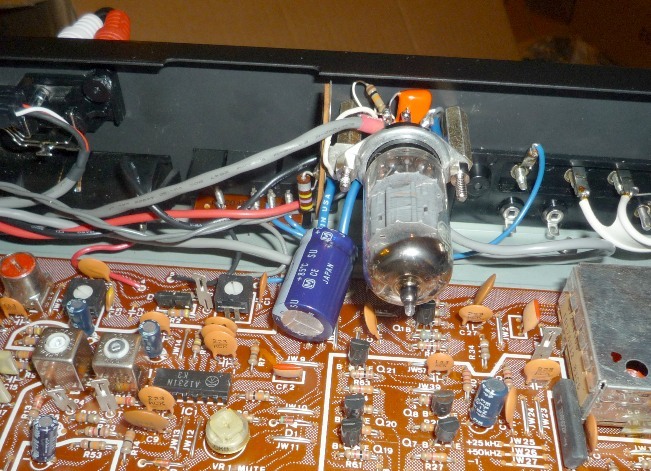 For more bass, install a 0.1uF cap from the plate of the triode driver stage to the output tube's control grid. But don't install a bigger cap on the grid of the triode driver to the volume control, as it could back bias the diode detector more, see below. Modulation acceptance is the amplitude modulation percentage (aka modulation index) a receiver's detector can handle without distortion. An ordinary diode detector can handle upward modulation well but detector circuits with capacitive loads have limited ability to faithfully reproduce downward modulation. At some point they clip the audio waveform before getting to zero. Typically an AA5 will start to clip modulation that drops below about 20%. FCC rules say the minimum is about 5%. This level is when the music is at the loudest. The RF carrier varies between 5% and 195% of the "dead air" RF level when the music is loud. This is known as "95% modulation". AA5s tend to clip on modulation above the high 80's. Assuming that the signal level at the detector is high enough to avoid the "knee" (non-linear region just above zero volts, which if you are using a 6AL5 can be reduced by running its heater at 4V) of the detector diode and only the use of RC filter caps to remove the IF frequency from the detected audio, you can get around -50dB distortion products in the audio out. This RC filter is the 100pF caps and the 47K resistor. If you then connect an AVC filter network to the audio output, the 0.05uF cap will take longer to discharge than the period of time of the typical audio waveform. Even though the AVC resistor (usually 2.2 or 3.3 megs) and the volume control (usually 500K) form a voltage divider for the voltage stored in the AVC cap, about 20% of the AVC voltage shows up at the detector diode. This causes the diode to be back biased, requiring extra voltage from the AM signal to conduct. This has the effect of clipping off the bottom excursion of the AM signal's carrier's modulation. An easy way to improve this situation is to make use of the second diode in the 12AV6 or 12SQ7 tube. 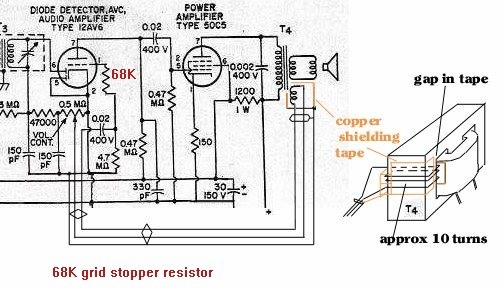 Disconnect the AVC resistor from the volume control or the IF transformer and then connect it to the anode of the extra diode. Add a new 470K resistor to that diode's anode and the other end to the 12AV6 cathode (usually ground). And finally connect a 30pF cap between the plate of the IF amp tube and the newly used 12AV6 diode anode. See diagram below. This gives us AVC action without messing up the detected audio, as they are now separate circuits. This requires two extra parts in an AA5, something manufacturers would avoid in a mass market consumer product. This mod may not make much difference in a small table set, but it should greatly improve a large console set or the AM section of a stereo system. 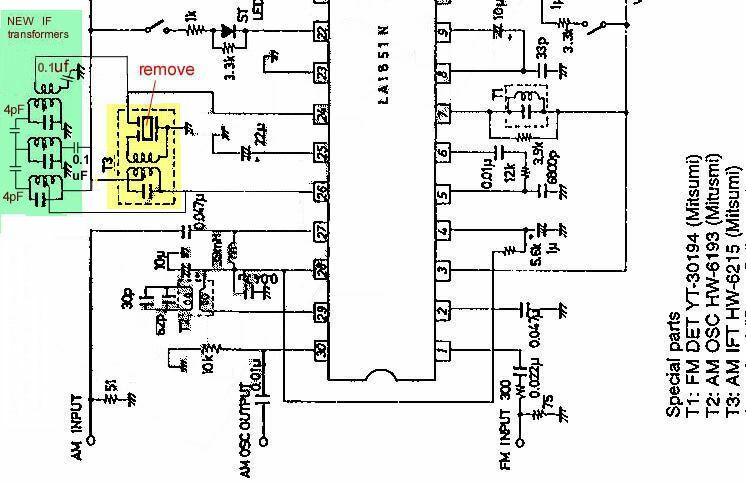 The audio coupling cap from the volume control wiper to the grid of the 12AV6 can also add to the problem, but the voltage divider effect between the wiper resistance to ground and the 10 meg resistor pushes it down to a per-cent or so. And this cap, being smaller, would discharge faster. A cathode follower could be used as a buffer to avoid even this, but the cost would preclude its use except in a very high end set. Another thing you should address is the small RF filter caps on the audio output of the detector. Have them too big and you can get tangent distortion because they take too long to discharge to allow a full amplitude 5KHz sine wave thru without getting tangent clip. Change the (usually) 100pf caps to around 33 to 47pF. 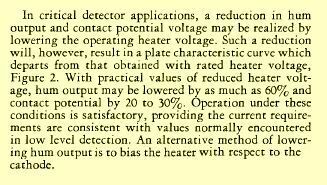 Reduced heater voltage on detector diodes like the 6H6, 6AL5 or 5896 can improve detector performance on weak signals. Less "contact potential" for the signal to overcome. This should increase the fidelity of AM detection. The 5896 below is a dual diode version. This reduced heater trick seems to also work well on 12SQ7's and 12AV6's. Only thing is to keep in mind that if you reduce the contact potential for the diodes, it also drops for the triode. But it seems that running the heater at 10V vs 12.6 seems to be a sweet spot. Parallel a 330 ohm half watt resistor with the heater in a series string set. If it's a 6SQ7 in a 300ma heater string, use 160 ohms if you have it, or use 150 ohms. For a 18FY6, a 510 ohm resistor would be about right. It shouldn't hurt the tube, as the current demand on the triode in an AA5 is quite low. The below graph (original source before edits: http://www2.famille.ne.jp/~teddy/datalib/heater.htm) shows the impact of reduced heater voltage on the 12AV6 triode. 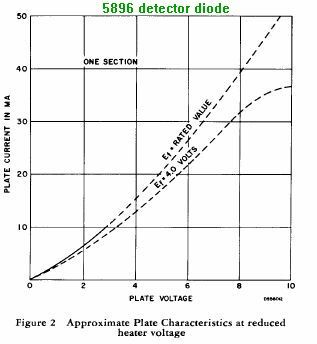 At 10V heater voltage the plate current curves are slightly shifted to lower plate currents vs plate voltage, but not adversely so. Around 9V things start to fall apart. 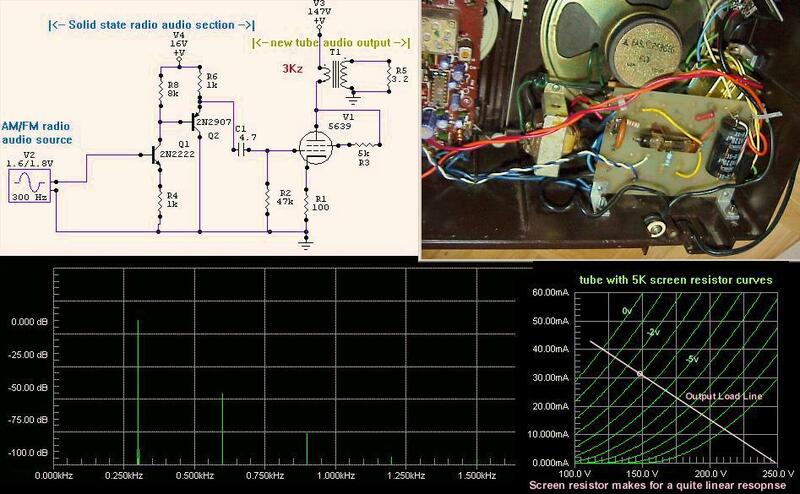 For a "hi-fi" AM detector that can handle a wide range of signal levels, and where you are willing to use extra tubes, a detector that is double buffered by cathode followers works well. Distortion down about 50dB and about 40dB for really weak signals (other detectors destroy weak signals). The first cathode follower buffers the radio station carrier from the last IF transformer. This allows heavy loading by the detector. Then there is a pair of detector vacuum tube diodes, one for the AVC, and the other for audio extraction. Then the recovered audio is directly coupled to a second cathode follower. This keeps to an absolute minimum the capacative loading of the detector circuit. Especially no coupling capacitor to back bias the detector diode. With C3, R4, C2 and R5 carefully selected for a good AC/DC ratio, this circuit can handle input signal levels from 20Vp-p to as low as 1mVp-p, with distortion levels of -50dB to -40dB respectively. The second cathode follower needs a negative supply to keep it linear on larger audio signals. 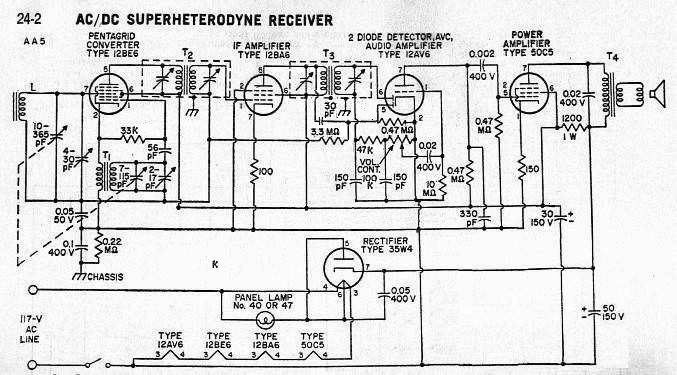 I obtained -8V by rectifying the 6.3VAC heater supply in the Heathkit tuner I modified with this circuit. Another way is to bias the audio detector circuit's ground up to around +25V. This gives plenty of headroom for the 2nd cathode follower to handle large signals. Once the simulations looked good I built hardware, and it sounds very good. The IF transformer secondary feeding the first cathode follower has a 100K resistor added across it to widen its passband now that the detector load isn't on it (not shown in the below diagram). At the expense of sensitivity, the audio bandwidth response of an AA5's RF and IF can be improved. This involves lowering the "Q" of the tuned circuits in the antenna and IF strip. Install a 100K resistor across the secondary of the first IF transformer. This should lower the "Q" to a value that will yield about 15 to 20KHz bandwidth. The secondary of the second IF transformer will be loaded with an extra 100K load on the detector output. This should improve distortion as well as lower the transformer's "Q". This distortion improvement is due to a better AC/DC load ratio on the detector. The DC load is the resistance directly connected to the detector. The AC load is the DC load with the addition of the resistance on the other side of the coupling cap feeding the grid of the triode. The signal level of each circuit will drop about 6 dB however. You might be able to get some gain back by connecting a small 15pf or so cap from the hot side of the primary to the hot side of the secondary of the IF transformers. This depends on the phasing of the magnetic coupling inside the transformer, however. The antenna circuit's "Q" can also be lowered. In this circuit, one would like an approximately constant bandwidth over the range of the AM MW band. A small resistance in series with the antenna coil before it connects to the tuning capacitor and converter tube will do this. Install a 27 ohm resistor here. After all this, you'll find the radio will only hear the local 50 thousand watt flamethrowers in town. But with better audio response. You can try to boost the gain in the IF stage by bypassing the cathode resistor with a 0.1uF cap to ground. You can use a low voltage cap here, as there will only be a volt or two across it here. Something to watch out for is 10KHz whistles caused by out of town station carriers if the bandwidth gets too wide. Contrary to popular belief, AM stations in the United States are not required to roll off audio above 5 kHz. For many years, no audio filtering was required, at all! In the early 1990s, however, a set of frequency response specs called NRSC-1 was adopted. Some type of standard was needed because, for years, many AM stations had been boosting the treble to compensate for the poor treble response of many tuners. This increase in treble had the side effect of causing more adjacent channel interference, which led radio manufacturers to further narrow the bandwidths of their tuners. The NRSC-1 spec specified a standard treble boost (pre-emphasis) curve. In addition to the treble boost, NRSC-1 required a sharp roloff above 10KHz. A related spec, NRSC-2 defined the amount of permissible emissions on nearby channels. The NRSC-2 requirements can be found in CFR 47, part 73.44. According to NRSC-2, any emissions 10.2KHz to 20KHz from the carrier frequency must be at least 25 dB below the carrier. Emissions 20KHz to 30KHz from the carrier must be at least 35 dB below the carrier, and so on. If you have the typical modern digitally tuned AM/FM stereo receiver for your home audio system, you probably noticed the poor quality of the audio from the AM section of the tuner. No audio high frequencies at all (above about 4KHz). As stated above, AM stations broadcast audio up to 10KHz. Which makes their AM modulated signal have 20KHz bandwidth. The FCC assigns carrier frequencies further apart than this in your particular town. Out of town signals on adjacent channels are usually too weak to be heard on your local station. Most modern receivers use a ceramic filter of about 10KHz at most, yielding audio that tops out at 5KHz. What I did to a set that uses a Sanyo LA1851N AM/FM stereo chip is remove the AM ceramic filter and its IF and replace it with a set of 3 IF interstage transformers taken from an old narrow band FM pager transistor radio (GE model 4er35a12 if you happen to have such laying around). See diagram below. All you need are 3 interstage IF transformers and a pair of 4pF caps. 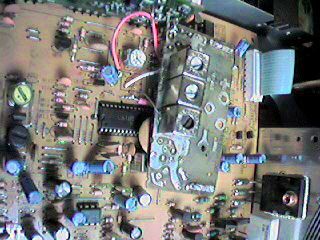 Here I cut out the section of the old pager circuit board that has these IF transformers and caps already wired and wired it to the stereo receiver board where the old ceramic filter and its IF was. You could do a neater installation than this, but keep the signal wires as short as practical. 9. 5KHz as you can see here. And the group delay, which is symmetrical. 20usec differential group delay has no real impact on the demodulated audio anyway. Of course you could just replace the old ceramic filter with one of wider bandwidth. These tend to be hard to come by. If the set is digitally tuned, you must select a new filter to be the same IF frequency as the old one. Or else the set won't tune on channel correctly. They come in 450, 455 and 460Khz. If the new filter is off by 10KHz then the set will tune stations one 10KHz channel off, but otherwise sound fine. The tracking across the band will be slightly off. Worse yet is a filter 5Khz off. Then you can never tune the station right. If the set is analog tuned (ie, slide rule or round dial with twist knob, with an old fashioned tuning cap) the worst that happens is that the dial calibration will be off slightly and tracking off slightly. Most dials aren't this accurate anyway. I used a pair of 5906 subminiature sharp cutoff pentodes. Triode strapped, but is that significant in cathode follower service? Well, I had lots of 'em, also the 26. 5V heaters makes it easier to run off the SS power amp power supply (+65V and -65V). Also submini tubes are "cute", and small enough to shoehorn inside this receiver. Used the +65V supply with series resistor and with the two tube heaters in series. Okay, but how about B+? Well, I built a kind of voltage trippler circuit with a second bridge rectifier and some "AC coupling" caps. See circuit. I built this on a salvaged small switching power supply board, using its old AC line bridge rectifier and filter cap. This board made a handy way to mount this circuit. The coupling caps went where an inductor filter used to live. The diagram below shows a simulated amount of power supply ripple (which is the amount I saw with a DVM via a cap after I built the power supply with a dummy load, but before I built the cathode follower circuit), and the tube's power supply rejection on the output. Which is pretty good. And here is a solid state table radio (a Panasonic AM/FM model RE-6280) that I added a tube audio output to. The tube is a subminiature 5639 "video" output pentode, not a beam power pentode. Normally this tube isn't all that linear in pentode mode, so triode mode improves it. But oddly enough, inserting a 5K screen resistor into the triode wired mode makes it more linear yet. AFAICT, this is just special to this kind of tube. But this might be applicable to other oddball tubes otherwise not usable for audio. The B+ is just directly rectified off the powerline, making this a hot chassis radio. But this radio chassis is easily isolated for safety. The curves below show the 5639 in pentode mode, standard triode connection mode, and the modified triode connection, with the 5K resistor between the plate and screen, and the load taken off the plate and the 5K resistor node. Any load line centered at 150V and 30ma drawn on the pentode mode curves or the standard triode connection curves will have rather severe non-linearities. The modified triode mode has significantly more linearity here. This one is a Sansui T77 tuner. Added a cathode follower on the output audio jacks. And the power supply for the heaters and B+. For that tube warmth (2nd H about 45dB down according to simulations, and after building it, by ear). .Wonderful tube sound!